Deer hunting on flat ground has advantages that include producing better quality forage so bucks can express more of their potential and being able to predict the prevailing wind direction while having fewer thermals. Hunting the wind correctly can be a deer hunter’s primary strategy for successfully harvesting deer, especially mature bucks that have reached an older age because they learned to avoid predators. Hunting the wind correctly reduces the chances of alerting deer. Deer that are alerted repeatedly tend to avoid those areas during daylight hours. I recommend avoiding alerting deer when possible. This may mean moving your stands off food sources and closer to bedding areas. In the pre-season I try to locate at least four good stand/blind sites. One for each possible wind direction. This allows me to hunt during almost all conditions. It’s okay to have multiple stands/blinds overlooking the same area but for different winds. I’d much rather setup with a crosswind. I call this threading the needle. My best hunts are often when the wind is such that I feel I’m on the edge of getting busted. I’ve experienced good success of mature bucks responding to grunts and coming into bow range using this strategy. It’s tough to set up near bedding areas. I try to find a location with a crosswind. That is to say the wind and thermals carry scent away from the bedding area and travel route where deer enter and exit the bedding area. Such setups are very difficult to find. If this setup isn’t available where you hunt then the next best situation is to setup for either only morning or afternoon hunts so the direction of deer travel can be forecast with some accuracy. This often means that the wind is blowing toward the bedding area in the morning or away from it during the afternoon. I like a favorable wind even when I’m hunting in an enclosed Redneck Blind. I often use the screen window frames and cover them with a thin clear film (like a clear plastic cooking wrap). I open the window I will shoot a bow out of and put the wrapped frame in the opening. I’ve tested shooting a broadhead through the wrap and my arrow flies great! I’ve had deer downwind in this scenario without getting busted. When hunting during the rut with a normal or colder than normal temperature and wind at least seven miles per hour consistently from one direction, I’ll hunt all day. If the temperatures are warmer than normal and/or the wind is mild and/or swirling, I’ll usually only hunt the early morning and late evenings when the thermals are predictable. You may wish to watch GrowingDeer #309. This shows an actual setup that I prepared for gun season using a crosswind to hunt two bedding areas and a feeding area. Hunting from the ground is an exciting way to hunt but keep the wind in your favor. If the wind shifts either leave or change. Check the wind constantly. 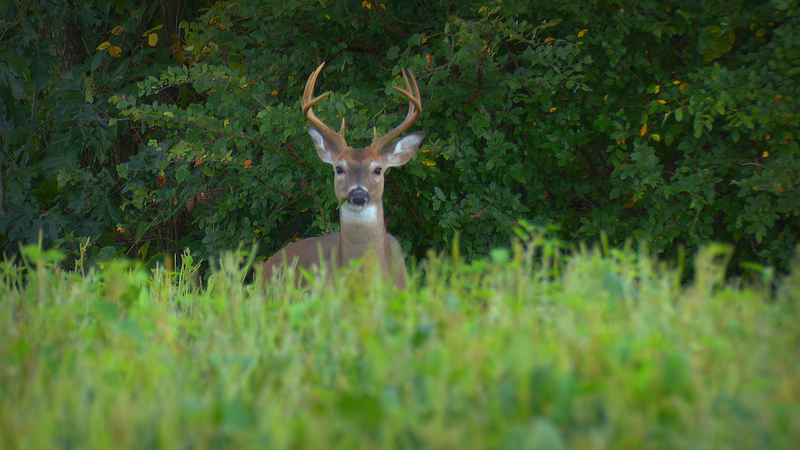 Often it’s best to time the hunt/approach of an area to occur just before or after you expect deer to be there. For example, stalk (with the wind in your favor) to a feeding area and arrive ten minutes before dark. This significantly reduces the chances of the wind swirling, etc. It’s not spending hours in the woods – it’s being at the right place at the right time. When hunting from the ground, rarely is the direct route the best route. Consider thermals and wind shifts due to topography, etc. Deer will avoid locations where they have been alerted or associate with danger. Scent carries better during moist than dry conditions. So we rarely hunt from stands where the wind is likely to swirl when the humidity is high. During high humidity conditions we are more likely to select stand locations on ridgetops or areas where the wind is not blocked by vegetation or topographic features. At such locations the wind is much less likely to swirl. I hope that using these strategies help you tag a deer this season – especially that mature buck you’ve been chasing for years!